"An empirical study of Hong Kong law students’ ethical values: Does common law education enhance their professionalism?" 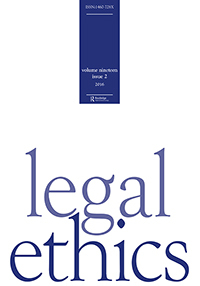 Abstract: This article investigates empirically the ethical values of law students in Hong Kong in their final two years of legal education. It first analyses the demographics of these law students before examining their responses to different ethical dilemmas. The findings suggest that feminisation has taken place in Hong Kong law schools. The study also found that a new generation of law students is emerging in Hong Kong that put more emphasis on the value of work-life balance. Finally, the article argues that common law education has enhanced the professionalism of law students in Hong Kong and has contributed to their development of such professional values as ‘professional integrity’, ‘obedience to the law’ and ‘civil duty’.